The Department of Education is considering moving Cypress Hills' Urban Assembly School for Collaborative Health Care into the Boys and Girls High School campus on Fulton Street. 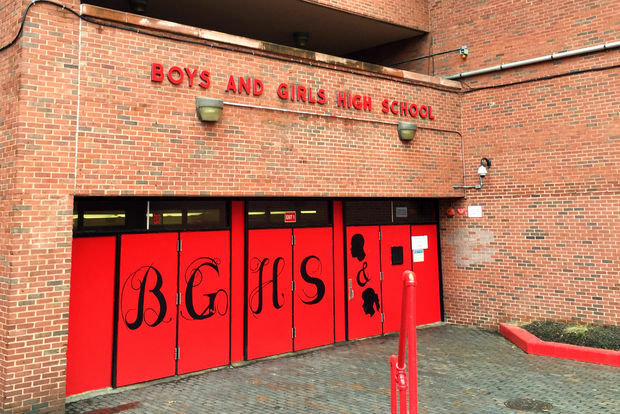 BEDFORD-STUYVESANT — The Department of Education's lack of communication over the possible plan to co-locate another school into the Boys and Girls High School campus "insulted" community members, they said at a meeting Wednesday. The Department of Education is looking to move Cypress Hills’ Urban Assembly School for Collaborative Health Care into the Bed-Stuy’s Fulton Street campus, which currently houses three schools. But many at the meeting said they were upset that the DOE had barely communicated with them about the possible proposal. Educators, parents and students from Boys and Girls High School, Nelson Mandela School for Social Justice and Research and Service High School gathered in the auditorium of 1700 Fulton St. to hear about the city’s plan, which officials said they have not yet submitted and is not set in stone. Many pushed back against the proposal, saying they had nothing against Urban Assembly but that they disagreed with the manner in which it was presented. Constituents said education heads promised they would be involved from the start of the process, but felt “disrespected” after a school was already chosen for the possible co-location. “Where is the collaboration, where is all of this talk about working together and being together?” said Martha Lane, United Federation of Teachers special representative for the Boys and Girls campus. Alumni and leaders from the three Bed-Stuy schools expressed concerns that they needed time and resources to focus on their own improvements and collaborations. Tabari Bomani, principal of Nelson Mandela, said he experienced his own struggles when his school first joined the campus, but has now been embraced by the community. “I don’t hear people being overly resistant to the idea of, ‘How do we use space efficiently for young people?’ What I hear is an idea that there was a promise made about when the community would be brought to the conversation,” he said of the proposed plans for Urban Assembly. Urban Assembly, which is currently housed in the Franklin K. Lane Campus at 999 Jamaica Ave., serves students in grades 9 through 11 and looks to expand to 12th grade in the coming academic year. The high school, which offers projects focused on city health issues and partners with healthcare facilities for lessons, is located three miles away from the nearest hospital. Relocating to the Boys and Girls campus would bring it closer to several hospitals, with Interfaith Medical Center being just a few blocks away and Woodhull Medical Center less than two miles from the school, according to officials. Since its inception at Franklin K. Lane, the DOE always planned to re-site Urban Assembly to find a more suitable location, said superintendent Fred Walsh. The DOE is committed to enrollment growth at Boys and Girls High School, officials said, and there remains additional space at the campus to house a fourth school while also leaving room for Boys and Girls to grow. The campus has a current utilization rate of 26 percent, according to the DOE. “Even if this proposal is not one that goes forward, the mayor and the chancellor will not allow seats to sit in a school unfilled which are meant to be filled by children,” said Charles Fisher, the agency’s director of space planning for Brooklyn. School officials stressed that Wednesday’s meeting was just the first step in the process of community engagement, and that the gathering for feedback was a “starting point” for discussions. Renewal Schools superintendent Michael Alcoff said officials heard “loud and clear” that attendees were not pleased with the DOE’s process, but defended the decision of pre-selecting a school for the building. “There are people who have a global picture of what’s going on. They know what schools are overcrowded, where students are not getting the services they need, and they also know where schools have space,” he said. Still, campus community members complained of a lack of “transparency and trust” from officials, raised worries about shared spaces like auditoriums and gyms, and wanted the opportunity to “come together with a plan” for the co-location. “I feel like you guys are just sitting here trying to pacify us,” Boys and Girls senior Kayla Johnson said to education officials. Following Wednesday’s meeting, DOE representatives said they would take feedback to the agency’s higher-ups. “Community feedback is critical, and we are working closely with each school community to ensure any future proposal best meets the needs of students and families," DOE spokesman Michael Aciman said. A walkthrough of the campus with educators is scheduled on Jan. 9 and further discussion on the possible co-location plan will be held at Community Education Council 16’s meeting at 6:30 p.m. on Jan. 17 at P.S. 26. Additional community engagement will be held as necessary, officials said, and public hearings are slated at both the Franklin K. Lane Campus and Boys and Girls sometime in February.